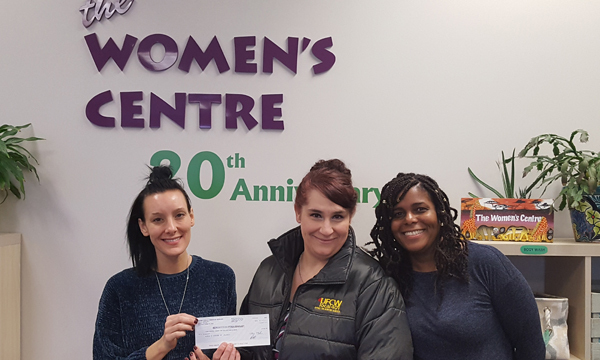 401’s own Teresa Ludwig was happy to visit the Calgary Women’s Centre to deliver the proceeds from the Women’s Committee Swap N’Shop held at the Calgary Members’ Centre. Held on November 29th, the Swap N’Shop not only brought together many bargain hunters from around the city, it also raised just over $400 for the Women’s Centre! In addition, the committee also put on their annual Brooks Bake Sale and they were able to raise just under $3000 through the sales! Some of these amazing baked goodies were also sold in Medicine Hat. Most of the proceeds from the bake sale went to the Women’s Shelter in Brooks and some also went to the Medicine Hat shelter. Thank you to all who were involved in any way, whether to set up, bake and/or donate items for resale, those supporting the event by purchasing items, and all who just popped in to see what was going on. Without everyone playing their part, fundraisers like these would not be possible. And a big thank you to the 401 Women’s Committee for your continuing support of women across the country by supporting the agencies who assist in that invaluable work.